Neustar has moved its headquarters to Home.Neustar, and the company’s individual services can now be found on several dedicated .Neustar domain names. This effective domain rebranding move is a natural evolution for Neustar, provider of information technology services, that actively embraces and supports the new gTLD namespace. Additionally, Neustar is celebrating its new digital identity with a new campaign, Unleash the Power of Your .brand. December 4, 2017 – STERLING, Va. – Neustar, Inc., a trusted, neutral provider of real-­time information services, today announced that it has revamped its global website with a new web address that embraces the use of a brand Top-Level Domain (TLD). All of Neustar’s digital assets will utilize its new ‘.neustar’ TLD to increase the effectiveness and stickiness of its online and offline communications. As of today, Neustar’s homepage resolves to home.neustar and each of its solution areas can also be found on .neustar web addresses, such as marketing.neustar, security.neustar and risk.neustar. As the world’s largest registry services provider and a global leader in managing and administering digital naming solutions, Neustar is committed to embracing the digital future and driving the connected world forward. Creating trusted interactions in a connected world remains paramount to growing and guarding any organization and because “.neustar” can only be used by Neustar solutions and services, customers who visit sites that use the new TLD can be certain that the information they contain is reliable and trustworthy. In addition, the new TLD offers unparalleled global brand value for Neustar and its solutions, as “.neustar” is easy to remember and it is an equally effortless brand identifier in all marketing collateral, online and offline. “It’s time for organizations to take back ownership of their digital brand and create efficient pathways for customers to find the online content they’re looking for,” said Tony Kirsch, Head of Professional Services, Registry Solutions, Neustar. Neustar is one of the first organizations to move its existing web address to a domain ecosystem it fully controls, allowing it to streamline the customer experience, enhance security for customers, simplify the online navigation, and deliver a plethora of advertising campaigns aimed at creating memorable and personalized interactions. The user experience will also undoubtedly become easier and more intuitive as customers will be able to use shorter web addresses that will bring them directly to the information they want instead of going through a lengthy and distracting online search process. 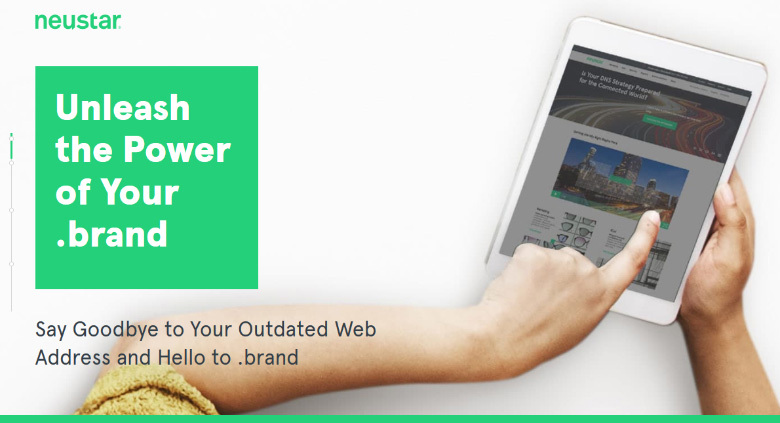 In celebration of Neustar’s new digital identity, it is running an advertising campaign (“Unleashing the Power of Your .Brand”) to highlight the unique ways in which branded TLDs can be used in today’s connected world. Neustar, Inc. is a leading global information services provider driving the connected world forward with trusted, holistic identity resolution. As the only company capable of understanding who is on the other end of every interaction, Neustar is trusted by the world’s great brands to grow and guard their businesses with the most complete knowledge of how to connect people, places and things. The combination of Neustar’s unique, accurate, and real-time identity system and our cloud-based workflow solutions empower our clients to make actionable, precise and valuable decisions across marketing, risk, IT/security, network & operations departments. As the sole provider of the U.S. Number Portability Administration Center, Neustar also facilitates the routing of all telephone call and text messages in the U.S.
For more information, visit Home.Neustar.